Pricing Table WordPress is a fully responsive HTML & CSS3 WordPress plugin. Top 10 Best WordPress Pricing Table Plugins. This is the new Pricing Table WordPress Plugin, Who has 4 different style templates for showing pricing table and it is easy and fast because Pricing Table WordPress Plugin is based on Irresistible CSS & JS With Pricing Table WordPress Plugin, you can show Pricing and features of your product. You can quickly add features to your different plans, choose a color and display your price table anywhere with a simple shortcode. 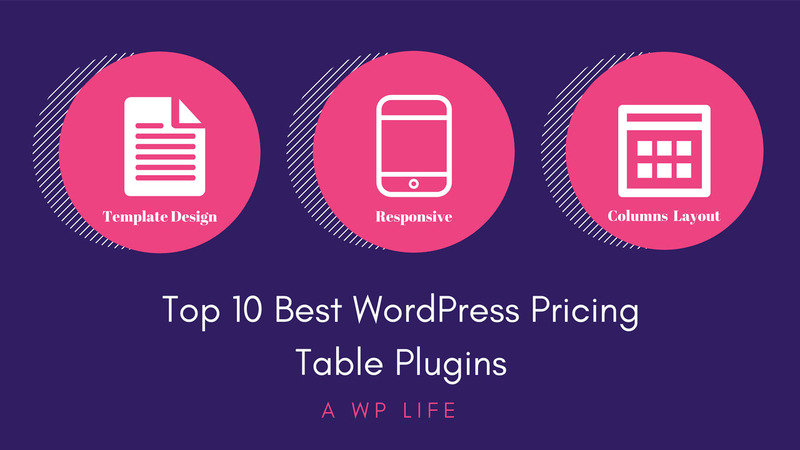 This is the Top 10 Best WordPress Pricing Table Plugins for any site Because this Pricing Table has many configurations. You can use it also in the sidebar as a widget, Just paste the shortcode in the text widget. this plugin easier to customize. It will be very helpful for new users, this plugin very easy in use for new and old users of WordPress. This plugin has many configurations you can see below. Display Pricing Table by Unique Post id. It’s possible with Pricing Table drag-and-drop generator by Supsystic. Choose pricing table template, edit content and publish on the website. It has never been so easy to create and manage pricing and comparison tables with table builder. Any element of the table can be customized with the mouse click. Design can do one of two things to your business – either sink it or raise it to the top. You have to be very careful when designing a pricing chart. Fonts, headlines, a layout of pricing table – it all has to be balanced and done neatly. Furthermore, you have to make sure the pricing chart’s design works with the main site. However, don’t forget about your main goal. In pricing tables, design is just a tool to achieve your objectives, namely – increase sales. Simplicity is the key to the success of the price chart. Remember that you’re not creating a collage for school, you’re creating a price table design for a specific reason. Don’t clutter your chart with unnecessary elements. A common mistake is to write down a list of features most of the plans in the pricing table don’t offer and then put dozens of red crosses in your pricing table chart. Consumers don’t want to see what you’re not offering, they want to see what you’ve got and for what price. Long waited premium pricing table plugin for WordPress published to display pricing grid on your WordPress site. this plugin generates pure HTML and CSS3 grid to display pricing table data. Variety of support for style, themes, and table items to display as your needs. Display YouTube, Vimeo video on each column. Easy to use anywhere via short-codes. Display image for each column. Background Image for table area. The plugin enables you to present various packages of your business according to your needs. You can create css3 table as many as you want with unlimited feature rows and unlimited package columns. The columns (packages) and rows (features) can be rearranged via drag and drop sorting. Also, you can choose any color for your css3 table you want for each part of a column separately, using the ColorPicker. The plugin also includes multiple package ribbons, feature tooltips, link buttons, and check/cross icons. The color of the package ribbons and tooltip is customizable, using the ColorPicker. ARPrice is the premium pricing tables plugin that lets you create responsive pricing tables & plan comparison tables in no time. No hassle, no fuss, just a powerful, flexible, real-time editor with multiple pricing table templates that lets you design pricing tables for various WordPress themes. You can also create team showcase using ARPrice so, its two in one plugin. Template to create Team Showcase so its two in one, not just Pricing table plugin. Unlimited color options to customize colors for price table templates. Use Drag & Drop To change order or price table Columns and its rows. Ready color schemes to create beautiful pricing tables. Different Shadow Styles to give better look to columns of price table. WordPress Pricing Table plugin will help you to publish pricing table on the WordPress page or post content. Using this plugin you can build a pricing or features table for your products or services in the easiest way. (table_id = use any table id here and replace the template with valid template names “rock” or “smooth” ) inside page or post content to embed pricing table. Anyhow there is also a TinyMCE toolbar button with post editor, you can use it to generate short-code easily. awesome pricing table by easy admin panel to drag and drop row column and delete any row or columns and update. use via shortcode anywhere with some awesome pricing table themes. Drag & Drop row, columns. Add the new row, column. Column Video or Images(Youtube & Vimeo). The background image for table area. 12 Ready Background Color Pack. 7 Ready Text Color Pack. Custom column background Color Pack(header, price, signup). Custom column text color pack(header, price, signup). Custom column text font size (header, price, signup). 16 ready column hover effects. Pricing Tables For Visual Composer is a visual Composer Addon that will allow you to add simplest pricing tables to your site with few clicks and customizable options. You don’t need to use any HTML type thing to deal with this plugin.It is giving you full control to customize the things according to your need.